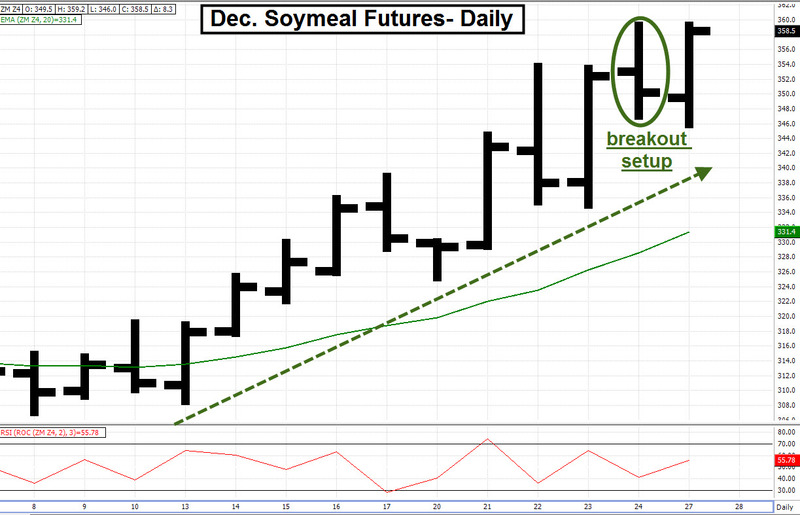 Soymeal futures have been rallying during October. Last week, a rally on Thursday was followed by an early rally and then a profit taking selloff on Friday. By the Taylor Trading Technique, Friday’s selloff would be the Sell Short day of the TTT cycle. We would normally anticipate a TTT Buy day for Monday however the relatively narrow trading range (Friday was an NR4 day) and doji bar give it a breakout setup for today. We need to be careful about having a directional bias when a market has a breakout setup. The range contraction and lack of directional conviction can mean one of two things. First, residual momentum may lead to a resumption of the anticipated move of the previous session, i.e., a Sell Short day would be followed by a downside breakout. The second possibility is that the breakout setup may be caused by traders’ lack of interest in trading against a strong trend. In this case, it would mean there wasn’t much interest in selling into a strong uptrend. In either case, when a market has a breakout setup we should keep an open mind as to the market’s direction (for the reasons listed above) and be ready for a volatility increase and a directional move as the market starts a new TTT cycle. As opposed to a standard TTT day, rather than look for a momentum reversal (as we would expect on a TTT day), we look for a move beyond support or resistance to serve as a launching point for a larger move in that direction. 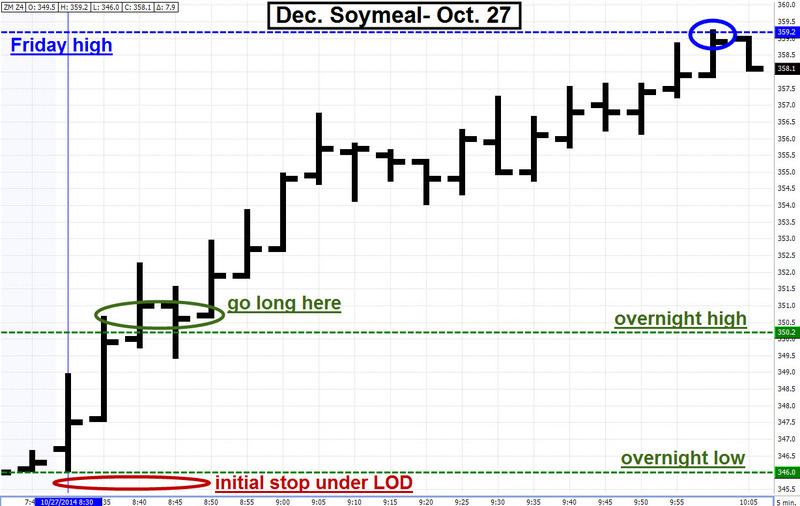 That’s why in this morning’s Swing Trader’s Insight Watch List (read it here) the soymeal comment was that we should use the overnight high and low as reference prices for a breakout move. I’ve written previously that overnight highs and lows are often good reference prices for both regular TTT days and breakout setups in grains and stock indices; this is especially true on Mondays, where the Sunday night trade often behaves like a separate trading “day”. For this reason we would use the overnight extremes as breakout reference prices, rather than the standard use of the previous day high and low. For the day session for December soymeal our breakout levels were the overnight high of 350.20 and low of 346.00; we would look to go short if the market dropped under the overnight low or go long if it trades above the overnight high. The day session open was 346.70 and it fell to a low of 346.10 before starting to rally. About 10 minutes into the session it rallied above the 350.20 overnight high, triggering our long entry. The initial stop loss could go under the session low of 346.00; if the session low was taken out it would indicate that the market didn’t have the bullish momentum it initially showed. The rally continued this morning; by 10 AM it reached Friday’s high of 359.20. This held as resistance for about 40 minutes and could be a signal to take profits if you were so inclined. If you did take profits, a move above Friday’s high, which occurred around 10:40 AM (didn’t make this chart), could serve as the long entry signal for a standard breakout setup move.